Pinscher and Schnauzer, Molossoid breeds – Swiss Mountain and Cattle Dogs. 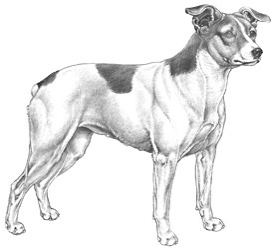 Brief Historical Summary: Recognised in Denmark and Sweden in 1987 under the breed name Danish-Swedish farmdog. The breed has been known for a long time on farms in Denmark and Sweden. The farmdog is used as a watchdog, ratter and companion. General Appearance: A small, compact and slightly rectangular dog. Known to mature late. Important Proportions: The body should be slightly rectangular, 9:10. The proportions between depth of chest and height at withers should be 1:2. Behaviour Temperament: Alert, attentive and lively. Head should be triangular in shape and a bit small in proportion to body. Skull: Rather broad and slightly rounded. Nose: Colour in accordance with colour of patches. Muzzle: Well developed and gradually narrowing towards nose but must not give a snipy impression. Muzzle slightly shorter than the skull. Nosebridge straight. Jaws/teeth: Jaws strong. Scissors bite with even and well developed incisors. Pincer bite tolerated. Eyes: Medium sized, slightly rounded, neither protruding nor sunken. Attentive and kind expression. Dark eye colour in dogs with black patches. Slightly lighter eye colour permissible in dogs with yellow or liver brown patches. Ears: Medium sized. Rose or button, in both cases the fold should be just above the skull. Button ears: The tips should lie close to cheeks. Of medium length, strong and slightly arched. No throatiness. Loin: Short, broad and slightly arched. Chest: Long, deep and roomy with well sprung ribs. Forechest well defined. Not set too high. Long tail or naturally short (stumpy tail). Tail should be carried straight, with a slight curve or like a sickle. General appearance: Forelegs straight and parallel. The front is broader than the ribcage. Metacarpus (Pastern): Strong and springy. Forefeet: Small, oval and not tightly knit. General appearance: Well angulated knee and hock joints. Parallel and well muscled. Hair: Short and smooth. Harsh on body. Colour: White dominating. Patches of different colours, sizes and combinations permissible, (black, tan, brown and different shades of fawn). With or without tan markings. Flecking permissible.